Be careful not to get pulled over when driving in the US. Some police watch and wait for the smallest traffic infractions. When driving in Los Angeles, it is not uncommon to see a police officer through your rear-view mirror, following you and waiting for you to make the slightest mistake. Fortunately, Miami police focus to "protect and serve". Of course, you can still get pulled over for traffic violations. Many out-of-towners driving on Miami's highways during their introduction to driving in Miami initially feel stressed by the many backed-up lanes, the abundance of cars and the many large trucks. 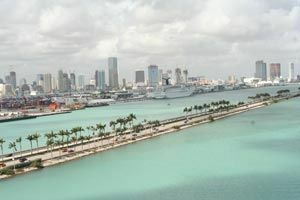 Ultimately, after their introduction to driving in Miami, visitors learn and adapt to Miami's way of driving, especially with the help of a guide of Miami. When driving in a different country or city, drivers should familiarize themselves with the regulations and laws and how they are applied by local authorities. As part of an introduction to driving in Miami found in a guide of Miami, drivers in Miami need to understand the "Miami driver". Miami drivers are known to be undisciplined and not very respectful of speed limits. Driving in Miami is challenging but you will adjust quickly after an introduction to driving in Miami found in a guide of Miami. Many drivers turn left or right without indicating with their blinker. Some may even indicate that they will turn left when instead, they turn right. Police officers can be more lenient with tourists, especially if they come from a different country or don't speak English or Spanish. Florida vacation rentals - Find furnished apartments , holiday villas and vacation homes in Florida. Visitors driving in Miami should know that when a police officer asks drivers to stop, the driver must comply immediately. Vacationers should always purchase full insurance or pay with a premium business credit card that provides similar benefits incase they have a car accident in Miami. If you are renting a car for your vacation in Miami, you should know some important Miami driving rules which you can find in the Miami city guide. If you are spending your holidays in Miami or Miami Beach, follow our driving tips from our guide to driving in Miami to avoid problems. The city of Surfside, just north of Miami Beach and south of Bal Harbour has introduced a new Miami radar system used to track speeders. Miami’s different municipalities regularly conduct campaigns to ensure that Miami drivers buckle up. In 2001, Miami Dade became the first county in Florida to restrict the use of cell phones while driving. According to the Miami city guide, when turning right on red lights, drivers are required to check all traffic signals, the pedestrian walkway and other details before proceeding. HOV lanes in Miami are reserved for vehicles that are occupied by more than one person (an inflatable doll does not count). In Miami you can dispute your violations or fines with the help of a specialized lawyer. There is a good chance you can be let off the hook if you hire the right Miami traffic lawyer. The city has specific parking spots designated specifically for parking a motorcycle in Miami. Driving a motorcycle or scooter in Miami that is more powerful than 50 cc requires a valid motorcycle license.